The Roland TM1 is a unique trigger module that makes it easy to add more sounds to your acoustic drum kit. Turn your Acoustic Kit into .. 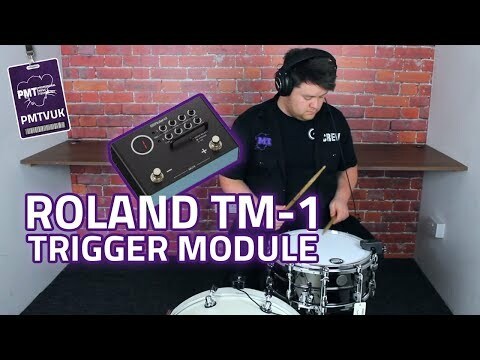 The Roland TM1 is a unique trigger module that makes it easy to add more sounds to your acoustic drum kit. Turn your Acoustic Kit into an Electric Hybrid! Import your own custom sounds or utilise TM-1’s onboard kick, snare, tom, cymbal, and percussion samples to your own samples and loops. Simply connect any compatible Roland trigger pad to the TM-1 and directly play the sounds you need, or mount an RT-series trigger to one of your acoustic drums and play with your preferred sample layered on top in perfect sync, with no lag whatsoever. Compact and very easy to operate, the Roland TM-1 offers a simple solution for first-time drummers, allowing them to bring electronic kit versatility to their acoustic drum kit with zero hassle.